Biker Performance is owned and operated by people who are passionate about anything and everything with a motor and wheels, so we know what it's like. How many times have you added that "last" part and said it's done? Yeah... so have we. We know that enough will never be enough. But we have all the parts and accessories you're going to want to make your motorcycle stand out from the rest and truly make it your own. We carry parts for Harley Davidson, Metric Cruisers, and Sportbikes. Unfortunately we also know what it's like to have to sit and wait on your parts to show up. That's why we're here. If you call our number during normal business hours,	you will get to speak with a live customer service rep, usually one of the owners. If we're already on the phone - we'll call you right back. Email us - and we'll return your email immediately. 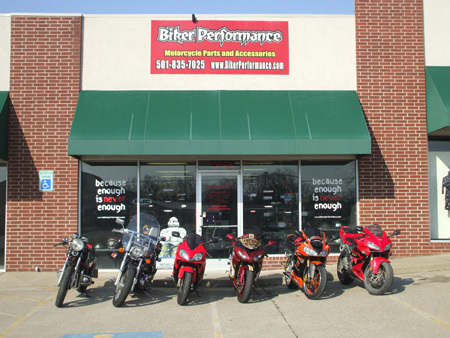 At Biker Performance you will get the customer service you deserve. Biker Performance has many parts ready to ship out immediately - but if for some reason your parts will take some time to obtain, or they are on backorder from a manufacturer - we'll let you know. We will always keep you up to date on what's going on with your order and not leave you in the dark. Please feel free to browse our online catalog - we are adding new products every day. If there's something you need that we haven't added yet, drop us an email at info@bikerperformance.com. Also if you find a lower price elsewhere - shoot us the link to the item and we'll do our very best to beat that price for you.